Over the last few months God has allowed several people to be brought across my path who are facing serious personal struggles. Two of my friends are grieving the loss of loved ones in recent weeks. A few of my friends are watching with grim courage one (or both) of their parents slowly slip from this world…two from dementia, and one from cancer. To be honest, I do not know how to comfort these people. I stumble over my words, I am ill-equipped to give more than a listening ear, or a heartfelt hug. I am not a counsellor. I promise to pray for them, but even then, I do not know how to pray. But God does. We have two divine intercessors: Jesus, at the right hand of the Father, interceding on our behalf (Rom. 8:34; Heb. 7:25; 1 Jn. 2:1), and the Holy Spirit interceding with groanings, and pleading on our behalf. (Rom. 8: 26). “We do not know what we ought to pray for,” but the Holy Spirit always knows, and God the Father will always answer His prayer. I am a “fix it” person. When I hear another’s trouble, I want to make it right. Unfortunately there are things in this world that are not always “fixable”. There are no words, no actions on my part that will make the hurt go away. I listen but then I must let go…let go and let God. In Henry Blackaby’s devotional he uses the 23rd Psalm to teach that the Lord, our Shepherd, is our comforter. “As a child of God you are never alone! Your Shepherd is with you at all times. You never have to call Him in to your situation. You never have to wonder where He is. You never have to fear that if things become too difficult, He will abandon you. He goes before you; He walks beside you; He comes behind you. He protects you securely. Just as He sees every sparrow and knows every hair that is on your head, so His gaze is constantly upon you (Luke 12:6–7). Even when you cannot see Him, He always keeps His eyes upon you. 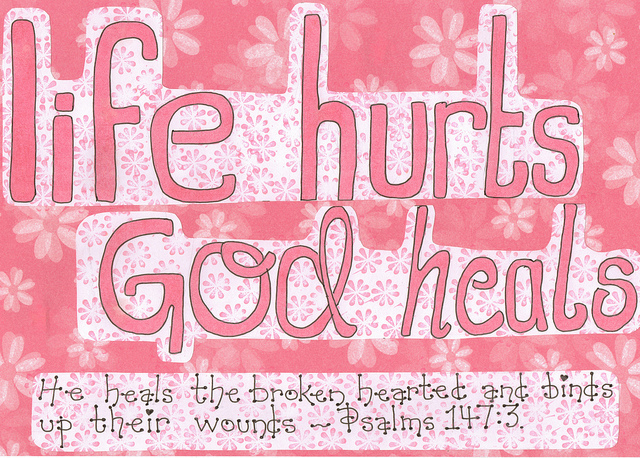 He comforts you with His strong presence in times of sorrow and grief. He leads you through the valley of the shadow of death. He does not necessarily lead you around the valley as you might wish. There are times when your Shepherd knows that the only way to get you where He wants to take you is to lead you down the path that passes through the dark valley. Yet, at those times He walks closely with you, reassuring you throughout the journey that He still loves you and is with you. It is during those times that you experience His love and compassion in a deeper dimension than you ever have before. May the God of all Comfort be with you always. This entry was posted in Inspiration & Devotion, Proverbs 16:9 - Journey Thoughts and tagged bgbg2, Challenges, Comfort, Devotion, Grief, Hebrews 7:25, Henry Blackaby, Hurt, Psalm 23, Romans 8:34, Scripture, Suffering. Bookmark the permalink.